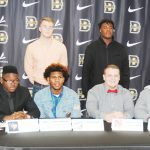 An exciting event took place at Dillon High School on Wednesday, February 7, as six student football players inked to play at the college level. On December 20, two more had committed. The ones who signed today were Jallian Williams, Dawson Dove, Ty’Quan Porter, Rodney Owens, Jalen Young, and Tae’Ron Bogin. The two to sign early were Jackson Hayes who committed to Campbell University in Buies Creek, N.C. and Za’Reon Hayes who committed to Appalachian State in Boone, N.C., on December 20. Athletic Director and Head Football Coach Jackie Hayes opened the standing-room only ceremony by thanking the players and thanking the parents of the players for allowing the coaching staff at Dillon High School the opportunity to work with these young men while preparing them for their futures. Coach Hayes expressed, “Each of you have been given an opportunity. Apply yourselves. Do not let your opportunity pass you by. We have prepared you for this day. Now, it’s up to each of you. However, don’t forget the most important thing is your education”. Each of you have meant a great deal to our football program at Dillon. Each of you have contributed, and some of you have even played while being injured. Coach applauded them for their dedication to the game. In closing, Coach stated “We believe we have the best football program in the State of South Carolina”. Rodney Owens signed with Palmetto Prep on Wednesday, February 7, at Dillon High School to play at the next level in his football career. Owens has played football all of his life…and still loves the game. He also plays basketball. Rodney was influenced mostly by Coach Chris Ray in the sport of football. Owens believes he will fit in well at Palmetto Prep as it is a small school and offers him an education and other opportunities while playing the game of football that he loves so much. While at Dillon High, Rodney played defensive end and tight end. Rodney recalls the many one on one drills while playing football. Hard work and dedication has been instilled in him; he will carry this trait with him to the next level of play. Owens was on a winning team and enjoyed the fruits of the labor…state championships and “rings”. Rodney enjoys playing football and working as his hobbies. Rodney’s parents, Rodney Owens and Lateria Smith, are very proud of their son and his accomplishments. 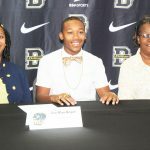 Another Dillon High standout, Ty’Quan Porter inked today, Wednesday, February 7, with Georgia Military School to take football to the next level. Ty’Quan’s brother influenced him in the sport of football. However, Ty’Quan has only played football since he was fourteen but he has excelled in the sport in such a short time. He also plays basketball. 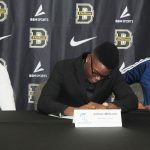 Although he was offered by other schools such as Elon and Georgia State, Porter feels that this school will be a good fit for him as it offers everything he is wanting to accomplish and will help him get to the desired goal, a degree in sport management. Although Ty’Quan received many awards while playing at Dillon High such as the Blitz Player of the year, 2017-2018 Shrine Bowl, and one of the Zonemen finalists, his MVP of the State Championship game will be remembered as the best one! Of course, the rings were not bad either. Also, Porter had 14 interceptions plus 10 tjs. Ty’Quan thanks the DHS coaching staff and especially the first coach he met at Dillon High, Coach Ray, who welcomed him with “open arms”. Ty’Quan enjoys eating and playing the game of football. At Dillon High School, Jallian Williams inked today, Wednesday, February 7, to attend Atlantic City Sports Prep at the next level of play in the game he loves so much…football. His mother, Catherine Hamer, has influenced him the most in the sport of football…and evidently it has paid off for him. Although Williams received several offers such as Highland and S.C. State, he feels he will be a good fit at Atlantic City Sports Prep as it is not located too far away from Dillon, and this school offers everything he needs plus it’s a great opportunity for him to play at the next level. As Jallian transcends to the next level, he will take culture with him. At Dillon High, Jallian was a running back and a strong safety. While at Dillon, he garnered such awards as All-Zone, All State, All Rookies, North/South Award, and the Player of The Week award. Williams enjoys playing Madden as a pastime. His parents, Catherine and Johnny Hamer, are very proud of his accomplishments and look forward to many more at the next level. 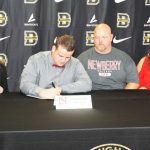 Dawson Dove has been playing football since he was 6 years old, and the desire is still there as evidenced today, Wednesday, February 7, at Dillon High School, as Dove signed to play football at the next level at Newberry Colllege. Dawson was influenced by his Father the most in the sport of football. Although Dawson plays baseball, he dearly loves football, a sport where he excels having played center for Dillon High School. Dawson will major in Biology (Pre-Med) that is a very demanding field. 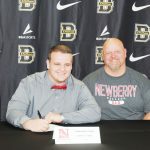 However, he feels he has made the right decision to attend Newberry as he loves the game of football so very much and after stepping onto the campus, he knew it was the right place to be…at home…and the coaches treated him very good. Dawson also received offers from Mars Hill University, North Greenville University, and St. Andrews. Dove picked up awards while playing football at Dillon High School such as 2015 All-Rookie, 2017 All-Zone, and 2017 All-State but most of all Dawson has enjoyed a winning tradition at Dillon High School where he earned 3 state championship rings in football. Dawson is well grounded and enjoys church and baseball very much. On Wednesday, February 7, Jalen Young took the next step in his football career by signing with Independence Community College. Jalen has played football since the young age of 7, and he continues to love the game that his older brother influenced him to play. Although Jalen devoted time to track and field, the love of football has and will continue to be his number one sport. Young has been fortunate to be a part of Dillon High School and the three state championship teams in his high school career. 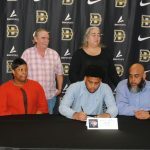 Although he received offers from other colleges such as Palmetto Prep and It Usa, he decided he wanted to be a part of another championship team, Independence Community College. He feels he can help them to continue to be a winner. Jalen will continue to work hard as he knows hard work and the proper attitude and effort will take one a long way to fulfilling one’s dreams. Young has participated in the early morning workouts and the winning tradition at Dillon High School where he played right tackle and center. He will continue to work hard to help Independence Community College to be a winner. He will pursue a degree as an athletic trainer while continuing to enjoy playing football. As a pasttime, Jalen enjoys listening to music. 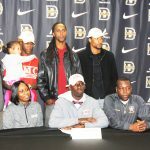 On Wednesday, February 7, Dillon High School was the scene of 6 young men taking their dreams of playing football to the next level after high school. Tae’Ron was one of the gifted ones who will proceed as he signed with Beuna Vista University. Having played football since he was 9 years old, Tae’Ron has always aspired to be better as he competed in the football arena. Bogin has grown up around football and really knows the game. 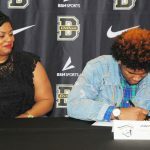 Tae’Ron should be a good fit at Beuna Vista University because the university is known for academics, and Tae’Ron can make an immediate impact on the football program. “I have really enjoyed playing football at Dillon High School where I was a member of a state championship team and winning a state championship ring is a great accomplishment,” stated Tae’Ron. While at Dillon High School, Tae’Ron picked up awards such as 2018 All State Select and was on the 2015, 2016, and 2018 State Champions football team! Bogin will transcend to the next level with his work ethic that will be intact along with his technique and respect for his coaches and hopefully wear #18 again as a defensive back or safety…but at the college level. Tae’Ron will major in studio productions with a minor in video production. While not playing or practicing football, Bogin enjoys playing Madden, making music, and writing. Tae’Ron’s parents, Za’Mekia Jones and Mary McCallum, are very proud of him. “We hope he will continue to excel at football, a game he knows and enjoys. We look forward to watching him mature even more on the football field”. Click once to bring the photo into a single screen, and then again to enlarge.